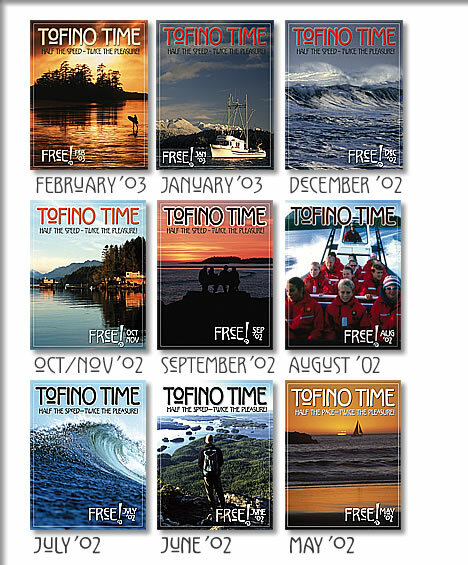 We are proud of each issue of Tofino Time Magazine. Our thanks to all who contributed – from the talented writers who have put forward so many of their best pieces to the photographers who helped us to paint ten thousands of words by allowing us to use their Tofino photos. Here are the articles we ran from our beginning in 2002 to 2011. Tofino Time Magazine archive from 2002 to 2010. Articles about Tofino, Clayoquot Sound on topics ranging from Tofino community events and activities to wildlife, nature, surfing, kayaking, gardening and health.